Private security firm Serco has agreed to repay about £68.5m to the government for overcharging on contracts to tag criminals in the UK, Justice Secretary Chris Grayling has said. It follows allegations Serco and G4S charged the government for tagging people who were either dead or in jail. The Ministry of Justice also says there were “serious issues” in two G4S contracts to manage court facilities. 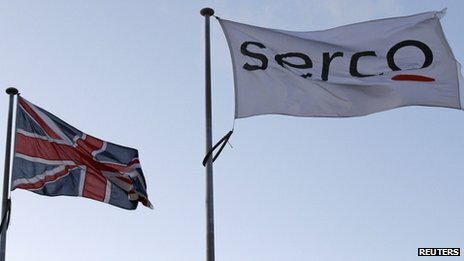 Serco said it “apologised unreservedly” for the contract issues. The matter concerning the G4S contracts has now been referred to the Serious Fraud Office (SFO). Both security firms have withdrawn from the bidding process to win contracts to supervise offenders on their release from prison. Earlier this month Mr Grayling said outsourcing company Capita would take on the tagging contracts by next April. An audit by accountants PricewaterhouseCoopers alleged that overcharging began as early as 2005. Meanwhile, a cross-government review of G4S and Serco contracts found weaknesses in the way the majority of contracts were managed, some of which were significant. BBC political correspondent Ross Hawkins said the review had uncovered three potentially significant problems in Department for Work and Pensions contracts for running the government’s Work Programme. He said Cabinet Office Minister Francis Maude had insisted the government would stick with outsourcing. Alastair Lyons, non-executive chairman of Serco, said: “The contract issues that were identified should never have happened and we apologise unreservedly for them. “We are doing everything in our power to make sure that such issues cannot reoccur anywhere in our business around the world. A statement from G4S said the company “places the highest premium on adherence to its company values, including customer service and integrity.